Email – it can contain a wealth of information yet it is also a huge time waster. Sorting through numerous daily emails trying to find the important ‘to you’ only type emails stuck within the folds of various “Sales” and “Twitter feeds” and “Facebook updates” emails. When I recently came back from vacation and logged into my email account, it’s was pages and pages of junk that I just don’t have the time to sort through! Most of it I ended up deleting and hoping it wasn’t something of importance! I recently came across a very awesome web app that organizes my emails for me into online categories as well as unsubscribes me from the many email lists I have signed for over the years. The site is called Unroll. After creating an account with them and hooking up my Gmail email account with them, I was able to successfully unsubscribe from 206 email lists (unsubscribe with one click) and then roll up 121 email subscriptions. 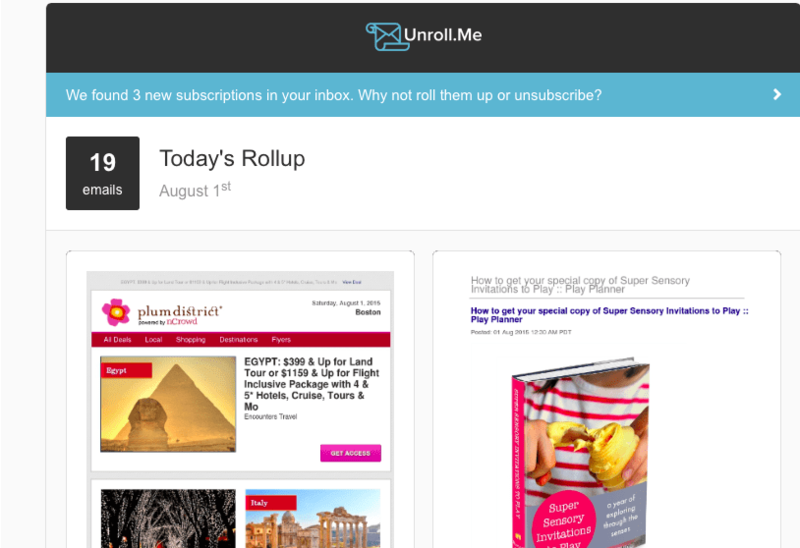 This means that whenever I get an email from one of the people on my ‘roll up’ list, Unroll will combine it in one easy email for me to view each day. Here are a couple of screenshots from my roll up email that I received on August 1st. So easy guys to go through and see exactly what emails I am interested in thus saving me so much time! Unroll works with Outllook.com, Gmail, Google Apps, Yahoo! Mail, AOL Mail and iCloud. Here is a link to their FAQs for other questions you may have about how it works. My Aunt made a New Year’s Resolution to unsubscribe more and subscribe less. I will pass this email on to her just as soon as I figure out what is going on in my own inbox. 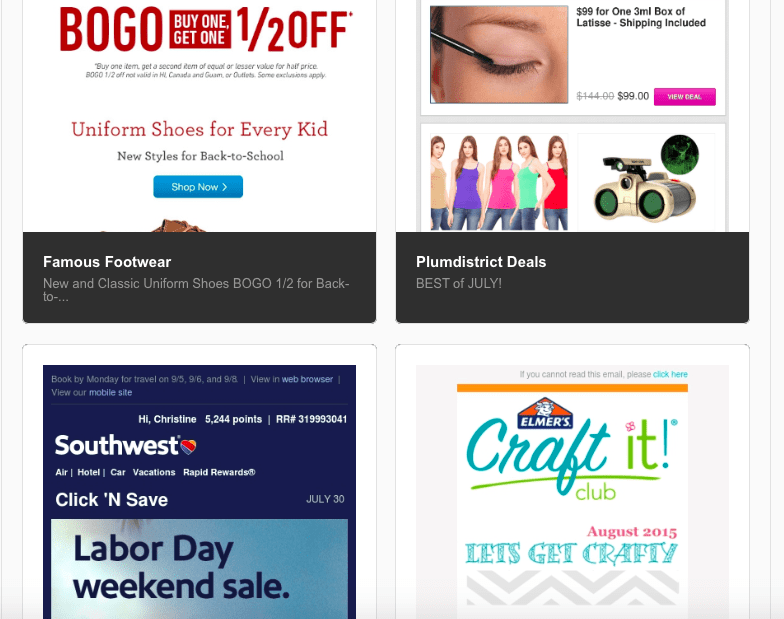 Christine recently posted…Spend Less Time In Your Email! What a great idea! I can’t wait to look into this! Thank you for sharing! Your welcome Kellie! Thanks for stopping by and commenting. Have a great day! Well that is pretty awesome. Anything to cut down on phone/computer time is a great idea! this is an awesome idea. I get so much email….I dread it, sometimes. I will be checking this out! Thanks for sharing. I LOVE unroll! It hasn’t gotten everything yet, but it takes care of most of my spam! Love this service! Really helped me eliminate the avalanche of email in my inbox! Definitely something worth trying! I always talk about how I never have enough time to go through all of my emails AND respond to the necessary ones. This might make that process quicker for me! Oh, I use Unroll me too! It is such a great little application! I love it! Jennifer Corter recently posted…A Lesson In Letting Go: Plus A Fun Project! This is awesome! I have so many junk emails, and half I don’t even remember signing up for. Can’t wait to check this out.